On Sunday April 27th, 2014, a moderate risk for severe thunderstorms was forecast by the SPC across eastern Kansas and Oklahoma, most of Missouri and Arkansas, as well as portions of Texas, Louisiana, Mississippi, and Tennessee. 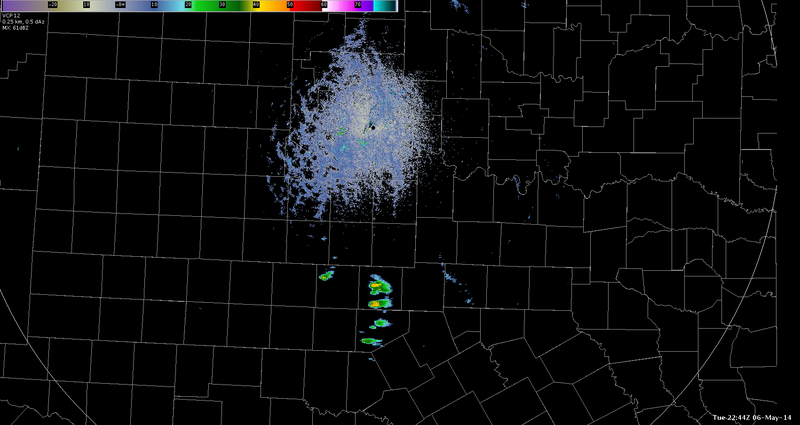 Before 12Z on that morning, convection developed along the dryline/Pacific cold front across central Kansas and Oklahoma. These thunderstorms became elevated as they moved east northeast towards Kansas City and western Missouri due to mid to lower tropospheric warm air advection. The early morning convection added uncertainty to the forecast as there was a question whether the atmosphere would recover and destabilize for convective initiation (CI) before the dryline and Pacific cold front moved through across eastern KS and western MO behind the morning convection. Visible satellite image from GOES-13, METARs, NWS Convective Watches and Warnings, and manually analized surface features valid 1815 UTC 27 April 2014. 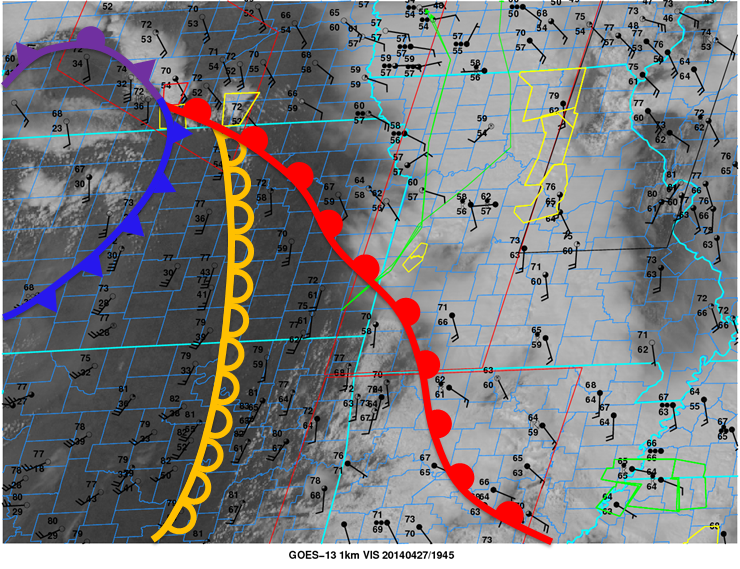 In the image above at 1815 UTC, although there was clearing right ahead of the dryline, extensive cloud cover and cool temperatures were present in the wake of the morning convection across eastern Kansas and western Missouri. 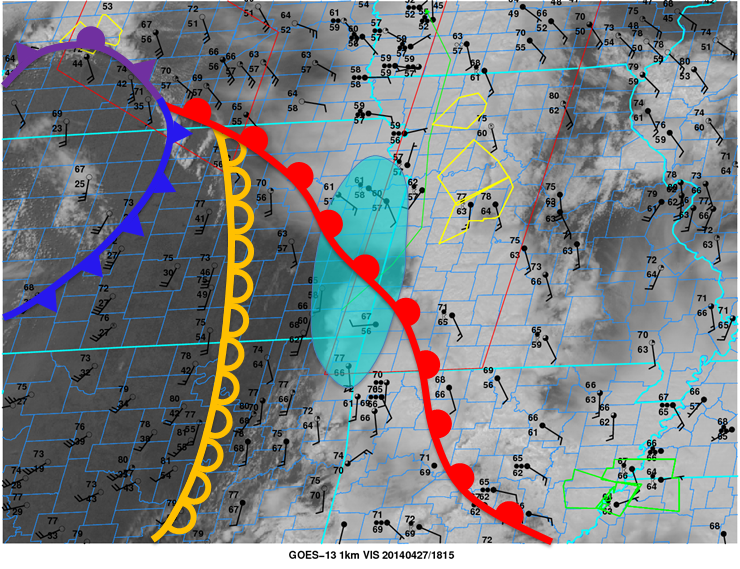 Ninety minutes later, at 1945 UTC, temperatures started to rebound into the lower to mid 70s across southeastern Kansas and a cumulus field developed ahead of the dryline across eastern Oklahoma. Visible satellite image from GOES-13, METARs, NWS Convective Watches and Warnings, and manually analized surface features valid 1945 UTC 27 April 2014. One of the GOES-R future capability products, Probability of Convective Initiation, provides probabilistic 0-1 h forecasts of cloud objects achieving convective initiation (35 dBZ or > radar echo). Inputs into the algorithm are convective cloud properties from either GOES-13/GOES-15 and 20 Rapid Refresh model output fields. This fused product is excellent at providing guidance to the mesoanalyst or warning forecaster on which portion of a cumulus field will develop into convection. In the image below at 1945 UTC, there were low probabilities of CI within the newly developed cumulus field across northeastern Oklahoma. Visible satellite image from GOES-13, GOES-R Probability of Convective Initiation [%], and NWS COnvective Watches and Warnings valid 1945 UTC 27 April 2014. 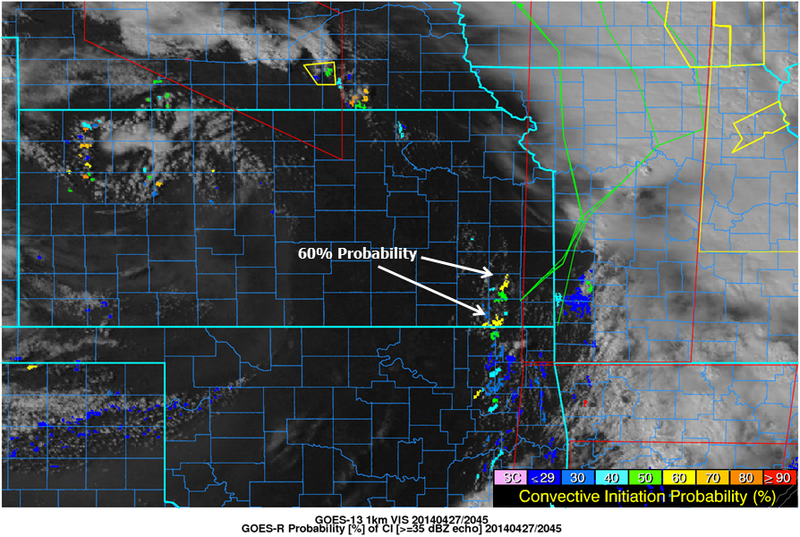 At 2045 UTC, 60 minutes later, the cumulus field developed northward into southeastern Kansas and probabilities increased to 60% within that cumulus field. This indicates a higher likelihood of CI and is starting to provide confidence to the forecaster that the atmosphere is destabilizing enough for the potential of CI. 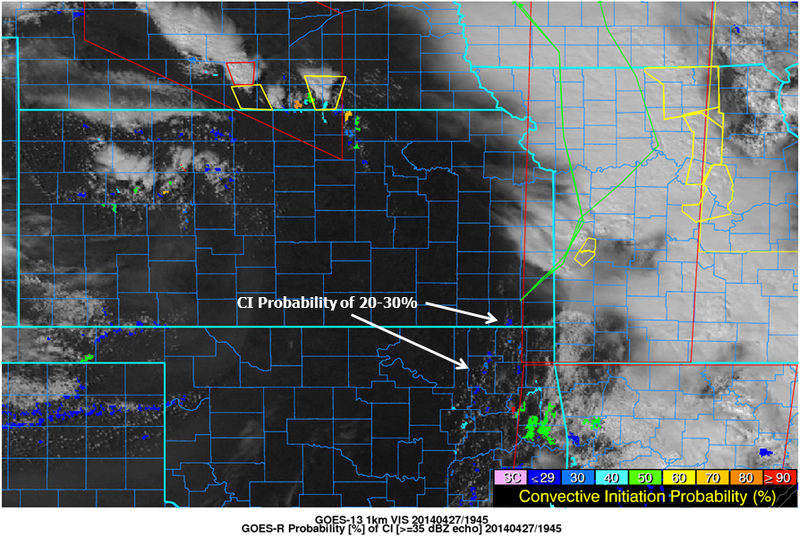 Visible satellite image from GOES-13, GOES-R Probability of Convective Initiation [%], and NWS COnvective Watches and Warnings valid 2045 UTC 27 April 2014. Another GOES-R future capability is the Convective Cloud-Top Cooling (CTC) product. This algorithm uses GOES-13/GOES-15 imager data and cloud phase information to provide situational awareness on which convective cloud objects are quickly growing vertically (i.e., a proxy for initial updraft strength). A stronger CTC rate is directly correlated with updraft strength and larger hail when compared to the WSR-88D maximum expected hail size algorithm. 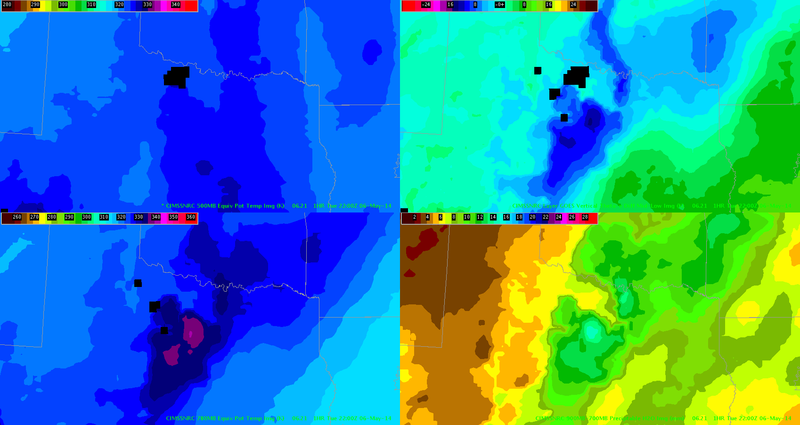 At 2125 UTC, 40 minutes after the elevated CI probabilities, two thunderstorms were developing across southeastern Kansas and northeastern Oklahoma. 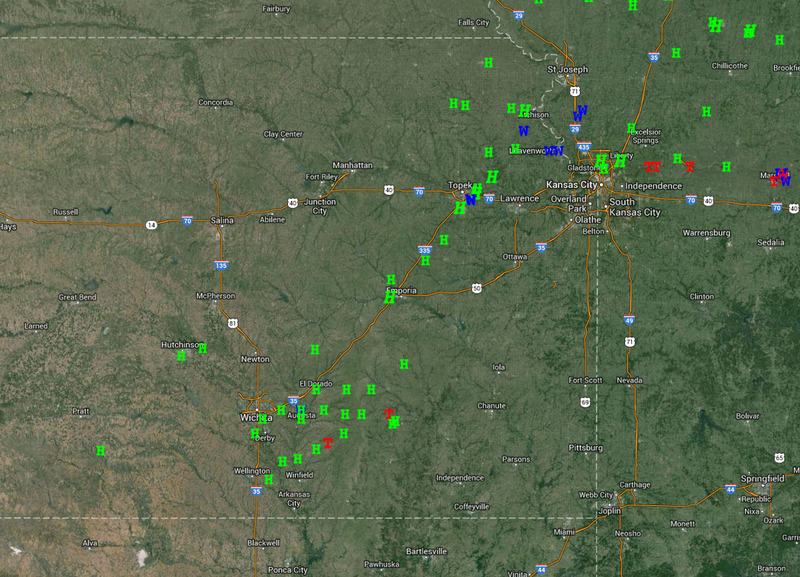 This is evident by the strong CTC detections in those areas. Visible satellite image from GOES-13, GOES-R Convective Cloud-Top Cooling [K per 15 minutes], and NWS COnvective Watches and Warnings valid 2045 UTC 27 April 2014. Fifteen minutes later, the first severe thunderstorm warning was issued on the thunderstorm with the northern CTC detection in southeastern Kansas. 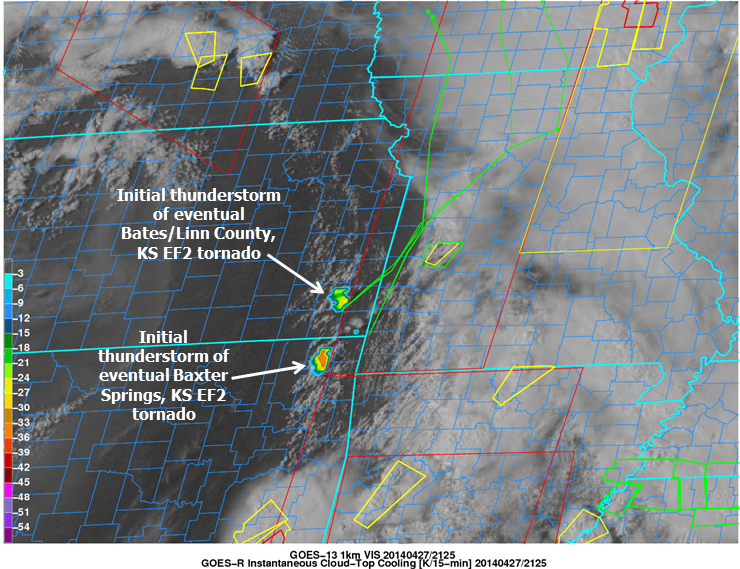 These two thunderstorms eventually developed into the supercells that produced the two EF2 tornadoes that affected Baxter Springs, KS (southern CTC detection) and Bates/Linn County, KS (northern CTC detection). Although the two products shown are GOES-R future capabilities, they are used today with GOES-13/GOES-15 data to demonstrate the algorithms and provide observational information of the convective environment that is not currently available with other datasets. When these two products are used together with observations forecasters are already comfortable with, situational awareness of the convective environment is elevated and more accurate short-term forecasts of convection may possibly be provided to partners.